It might very well be America’s most serious issue. I know it’s one that middle class America, you know, us peons get most ticked about……….the double standard. If I did what THEY do, I’d get thrown in prison. We know who THEY are, the Bill and Hillary Clintons, Obama……….. and all those Congressional men (we don’t know, but possibly some women) who used tax payer money to hush those they sexually assaulted. I’ve never had a LUSH fund that would have covered for me……..how about you? Nope? I don’t have a (charitable) foundation with a funnel running from it into my pocket. So, I’m not misleading anyone into thinking a nice little donation will go along way to help the poor in hurricane ravaged Puerto Rico or Haiti and then spend it on a vacation to Russia so I can make a speech for half a million, while my girl friend promises you’ll get some Uranium (that doesn’t belong to me) for your efforts. No, if I did all that in one breath, I’d get the cell doors slammed behind me. But, not in this country…….where the Uppity Class in high places covers for one another (crimes in itself). Its a huge DC corruption circle…….famously known now as The Swamp, with the Left’s sweetheart Hillary Clinton in the center. If I or you did what she has done………we’d also likely be in prison for having funded a murder or two or at least been investigated. The little Rocketman in North Korea has done less damage to this country and poses less a threat than THE SWAMP. Point is………..he didn’t need one. Not enough evidence to investigate Hillary Clinton? IS HE FREAKING KIDDING?!!!! Comey and the email fiasco, isn’t enough? There is enough to investigate Comey…….let alone the Queen of Crime. 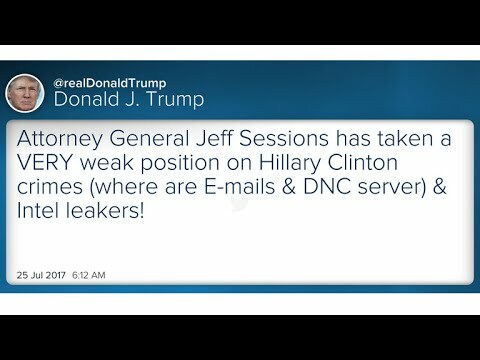 Sessions is doing what everyone before him has done………… cop-out, run-away. He is afraid of the Clinton Crime Cartel, he knows people die! What a coward! Sessions should definitely be fired. Immediately! Sessions is proving to be a part of the Elite Washington Establishment. He is part of the system. Protect all that is wrong about D.C. Sessions is scared to death where an investigation would lead. Think about this, he just did ask for the DOJ to evaluate if a special counsel should be appointed; and got his answer THAT QUICKLY! He already had the answer, it was his.